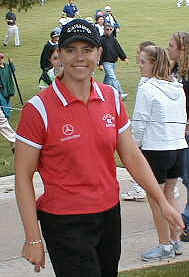 Annika Sorenstam playing the 2003 Colonial Invitational golf tournament story and pictures. Annika Sorenstam's performance Saturday with a birdie to halve a skin and then a spectacular hole out of a long bunker shot and an eagle on the final hole and $175,000 to take the early lead in the Skin's game just adds credence to Colonial's (and the PGA Tour's) decision to let her play there this past spring. Sure there was controversy about it and justly so. Obviously a ratings booster for the Skins Game, she put on a good show yesterday. Just like she did at Colonial. Playing at the Colonial was never about beating the men. It was a personal test or if you will have it, challenge for her to find out, 'Could she compete against the men?' After her performance at Colonial, Annika said she thought if she played the tour full time that she thought she had the skills to finish top 125 on the money list! Can you imagine the nerve (my tongue in cheek!) Well, it may have been only one shot she made but it's also another shot for golf, women's golf, and controversy! There's a "whole' lotta' crow'" being eaten somewhere over there around the Colonial Invitational golf tournament this morning. This caddy tries not to 'kiss and tell' or exploit the inside family business of the PGA Tour and it's players. I've never been much of a fan of that sort of thing. And, when I give you my inside 'opinion' about something, it's also with an attempt to base that opinion around some substantial facts. For the last couple of months I kept hearing about how Annika would play this week at Colonial. You see, we hang out at 'Caddy Central' our traveling tour van and restaurant primarily for the caddies but just as frequented by the players today as well, each week on the PGA Tour. It's a place for us to ventilate after a round, have some lunch or breakfast, and commiserate amongst one another (outside the scrutiny of the press and viewing public. The majority opinion of tour players I heard over the last couple of months, (maybe these were just the most vocal opinions), said, Annika had 'No Chance' to make the cut, and their two friends, 'Slim and None', to break 75 any one day there at Colonial. And the implication thereafter was also that this was a wasted exemption, basically a publicity stunt, and why are they using (abusing) 'Our tour'? Speaking as 'experts' I listened attentively to their reasons, -'She hits it too short', 'The greens are too small and hard', etc., etc. -a myriad of reasons why any chance of realistic success for her were already 'doomed' before even the first shot was fired. Granted though in yesterdays first round, she did have a lot of long putts due to the length of her second shots into the greens, which we all knew would be a disadvantage with her length off the tee. (Although she hits it farther than the 'experts' said she would). This gave her fewer realistic birdie chances than the longer hitting men ordinarily would gain from such a good ball striking round as Annika's was yesterday. Boy but were 'They' wrong! And what class she evoked in handling the pressure this week! I'm thinking back to Michelle Wie at Honolulu this year when she played in the Monday (men's tour qualifier) for four spots to play in the Hawaiian Open in January. Michelle, at 13 years of age, out drove her playing partners (both men) about 5 or 6 times that day at Oahu CC. Imagine what she learned from that experience! At 13!? All I've heard Annika say this week is, 'The worst that can happen is that I'll learn something'. I remember and watched Tiger Woods elevation into the game the same way, and always hear from psychologists, and sports experts, that he is a fast 'learner'. These highly successful great athletes, both men and women, are constantly challenging themselves to take risks to get better, test themselves, and move on to the next level. Annika like, Tiger is a great example of that. And she's now blazed a path for the next big break through, in the world of professional golf -'A woman one day winning a men's golf tournament'! Can you imagine such a thing? Now I can! Wie, at 13, says she wants to play half the time on the ladies tour, and the other half, on the men's tour! One reason is because she hits it so far, they'll have to remake all the layouts on the LPGA Tour -Michelle hit pitching wedges into most of the par fours she played at the Dinah Shore -and that makes it too easy for her. The very same reason Annika can't win this week, is the difference in length and the disadvantage from the second shot into the greens -against the men hitting more scoring clubs with soft high shots into those tightly tucked pins on the men's tour. She just can't get enough opportunities to make birdies to win this week realistically. But with Michelle. In four or five years. A more even playing field arises. A quick learner, with that special 'Eye of the Tiger'. Watch out folks. You'll be hearing a lot about this girl. Yes I think Annika has shown us all already, regardless of how she plays today, what is possible. And what class! And her 'exemption' now smells very much like a rose. Go girl! Original story: May, 19, 2003. All the 'hoopla' this year is about Annika Sorenstam and the 'exemption' to play and compete against the men at this week's Colonial Invitational Golf Tournament. There is a general feeling amongst the players and caddies that this was not the place to give it to her. Why? Forget the fact that she's a woman playing in a men's tour event. Forget whether or not she makes the cut. Forget the fact that women still don't compete with men on an even playing field in America -though it has come a long way in the last 25 years. And give up the idea, that someone who hits it shorter has an 'equal' chance against even the average lengthen driver on the men's tour! And we all recognize that it's good for the sport and the game of golf for the attention it will bring here this week. But it was an unnecessary 'ploy' by the tournament director and sponsor as well as the commissioner of golf this week to hold it at Colonial and to 'exploit' an already strong and rich event. Why didn't the PGA Tour and the current commissioner of golf, Tim Finchem, exercise more forethought about this though? There are plenty of more appropriate lower profile tournaments who could have used the publicity to their advantage. For instance the B.C. Open played in July, who's supported the PGA Tour for a quarter of a century now in a weak position against the British Open? They could have used the shot in the arm, Annika could have played there in an 'off' week against the weakly televised British Open. The caddies and player's of the PGA Tour know well that those 'weak' field events still host low scoring, a high level of competition, and quality golfing value. Plus there wouldn't have been all the dissent to her playing in an event like that later in the year. You see, the issue here amongst the players on tour is that this is a small field invitational event. You must be top 70 on this years money list by such and such a date. You must be a tournament winner in 2002...etc, etc. Giving her a spot here only takes one away from someone who's earned his way to play in the tournament. This is at the core of the dissent against her competing this week. And, it's not Annika's fault. And, Vijay Singh's comments were exactly what they all needed (wanted) to hear. A big strong virile male athlete bashing a champion women's athlete! Exactly what they needed. Now all the attention? Can you imagine what they'll make off of all of this? With regard to Finchem not stepping up to the plate about these complaints by his 'people', in this case, and allowing her exemption to take away an earned opportunity from a PGA Tour member, that will only benefit an already rich -the Colonial Invitational Golf Tournament($) and it's new corporate sponsor -Bank of America($), CBS Sports($$), and the PGA Tour($$$)! Personally, I'd love to see her do well. Imagine the pressure she'll be feeling on the #1 tee about to hit that first shot in an 'all or nothing' 'opportunity'! Put yourself in her shoes. Think you could even pull it back on that first tee on Thursday!? Do you think maybe Vijay withdrew to open up that one spot!? (The next alternate who got in as a result theoretically fills the one taken by Annika's exemption).